HENDERICK MITCHELL Joey on the remix duties. Nuff said... Favorite track: Drum Vortex (Joey Anderson Remix). Includes unlimited streaming of Drum Vortex via the free Bandcamp app, plus high-quality download in MP3, FLAC and more. Hailing from Tel Aviv, and cutting her chops on the Los Angeles underground, Mor Elian is a relatively new name on the block, but her deft tastes have seen her share the stage with the likes of Kerri Chandler, Mike Dunn, Seven Davis Jnr, DJ Qu and many more, and most recently, releasing her debut vinyl release on the excellent Prime Numbers label, featuring FXHE’s OB Ignitt on remix duties. 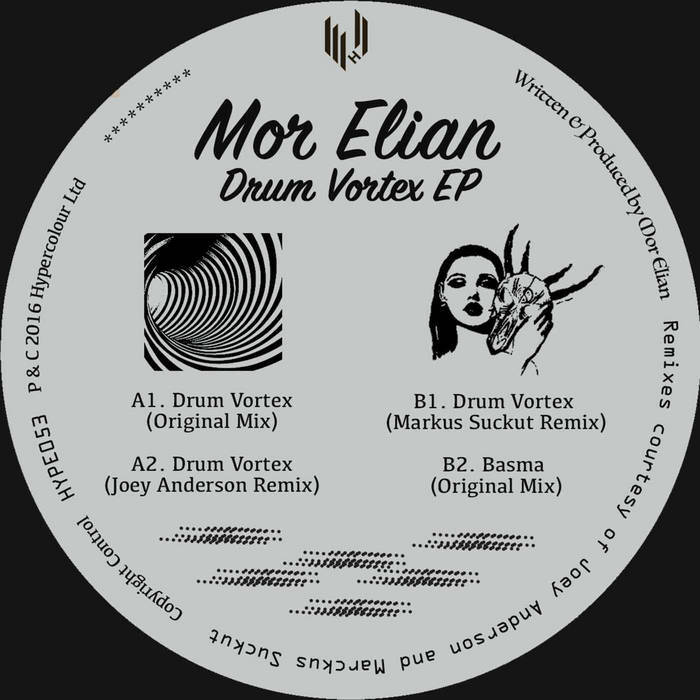 On ‘Drum Vortex’, Mor strikes a killer release for Hypercolour, enlisting two big remixes on the release from Joey Anderson and Markus Suckut. On her original mix, ‘Drum Vortex’ rolls out a ricocheting drum workout that indeed goes through the vortex; otherworldly voices and cosmic drones sit in the middle of the mix whilst the rides and hats intensify. Joey Anderson has proven himself as one of the most diverse house producers out there, with offerings for Dekmantel, Syncrophone Recordings and Tanstaafl Planets. Joey remodels ‘Drum Vortex’ into an old style warehouse dub; rolling congas and snares with incessant synth stabs and bending strings, making up for one serious remix from Mr. Anderson. Another interpretation is on offer from Markus Suckut, whose techno prowess has shone for labels like Rekids, Be As One, Mosaic and his own Exile label (run with Johannes Heil). Suckut’s trademark dense beats are in play here, shuffling hats and micro bleeps weave through vocal elements and sturdy percussive work, bringing a touch of the Berghain style to this remix package. Closing the release is another original production from Mor; ‘Basma’ again focuses of the drum groove, with bright and springing claps bouncing off the hazy bottom ends and melodic touches. Pacey and energetic, Mor gets bang on the groove to carve out a club little B2 style track in time honoured tradition.